I’ve been riding my bike a lot this year. Since my last half marathon on June 7, I’ve focused almost exclusively on cycling. Well, there was a two-week beer tourism adventure in southern California, but even while there I borrowed a bike and cruised around on beachfront San Diego trails. When we got home from California my plan was to run and ride on alternate days. After all, I do have this marathon that I’m registered for in October, so I wanted to keep the running edge fairly sharp going into summer. I planned to do a couple of easy 7-10 mile runs per week, and then ramp up the marathon training in mid-August. Why the delay until mid-August? Because CFL and I are also registered for a 6-day, 400+ mile cycling tour in early August. I naively thought that I could keep up with the running while also training to ride multiple days’ worth of 70+ mile rides. I was wrong about that. Something had to give, and it was the running. 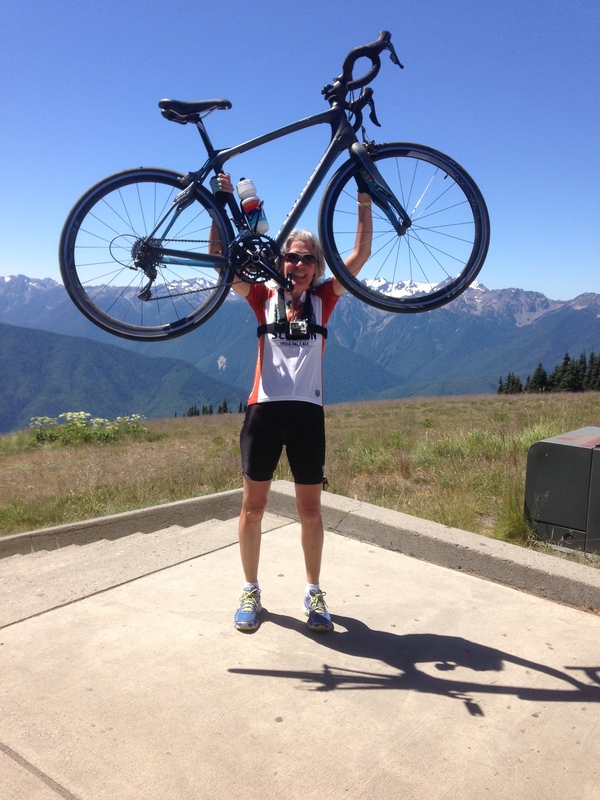 My first big cycling test of the summer was a ride up to Hurricane Ridge. I’ve written here about CFL’s adventures with Ride the Hurricane. I used to be in utter awe of him or anyone who could do this ride. It’s the steepest climb in Washington state and in the top 100-rated climbs in the country. On the first Sunday in August, the road leading 18 miles up to one of Olympic National Park’s supreme tourist areas is closed to all but cyclists. On any given day in summer, however, you might see a dozen or more cyclists winding their way up 5,000+ feet… and then speeding back down the hill! I have attempted to do it, beginning my ride from home, several times, but never got past mile 3. CFL kept telling me the first 6 miles are the steepest. When we heard that 125+ cyclists were coming over from Victoria, BC on July 1 (Canada Day), we decided to tag along. The road wasn’t closed but we figured there was safety in numbers. I decided I’d start my ride 6 miles up the road, giving myself a starting elevation of about 2,000 feet with only 3,200 feet or so to climb. It took me a long time but I did it. I think I got passed by every Canadian rider on the way up. I was pretty tired at the top, but not too tired for the obligatory, celebratory photo. I was really nervous about riding down, but it wasn’t too bad. I stopped a few times along the way just to remind myself that my brakes do, in fact, work perfectly well. After that, my next challenge was a 70+ mile ride. We figured out that we could start at a trailhead on the north side of Lake Crescent and ride from there to Forks (of Twilight fame) and back. All but a dozen or so miles each way would be on a bike path, while the rest would be on US 101, which does at least have a wide shoulder. The day we planned to do it, there was rain in the forecast. Being intrepid Pacific Northwesterners, we put our rain gear in our waterproof backpacks and off we went! It rained. A lot. 24 miles out we’d had enough, and we turned around. A week later we tried it again. This time it was an unusually warm day. We actually liked that, as our tour will be in a warm area and heat training is hard to come by where we live. By the time we reached Forks, it was nearly 90 degrees. 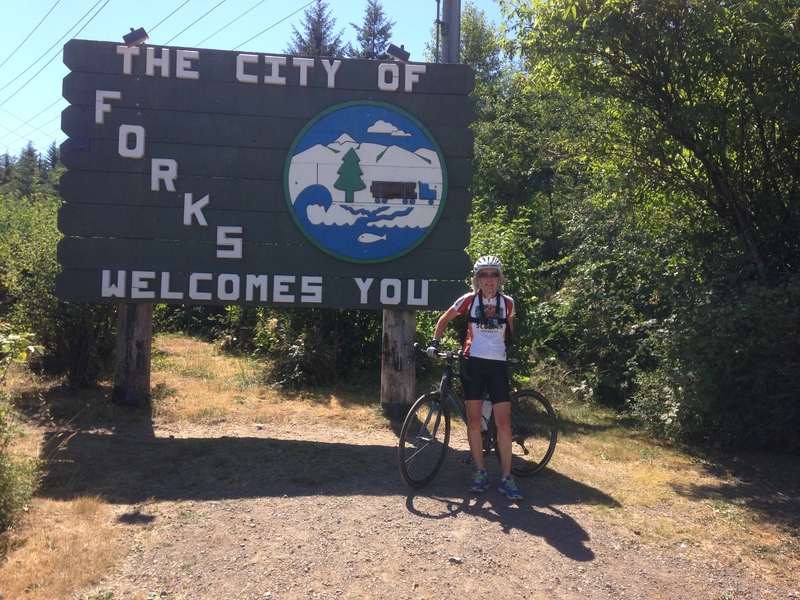 Of course we had to stop and get photos at the “Forks welcomes you” sign. We found a small cafe where we had sandwiches and ice cream, and refilled our water bottles. Then we started back. Six miles out of Forks CFL got a flat tire. I watched closely while he fixed it. In my cycling career I have yet to get a flat tire. I’m still not sure I’d be able to fix it when I get one… I am keeping my fingers crossed! We got very hot and tired riding back. We refilled our bottles a second time. I then nursed my bottle back to the car, while CFL took to topping his off at likely-looking small streams. That ride turned out to be 73 miles, round trip. 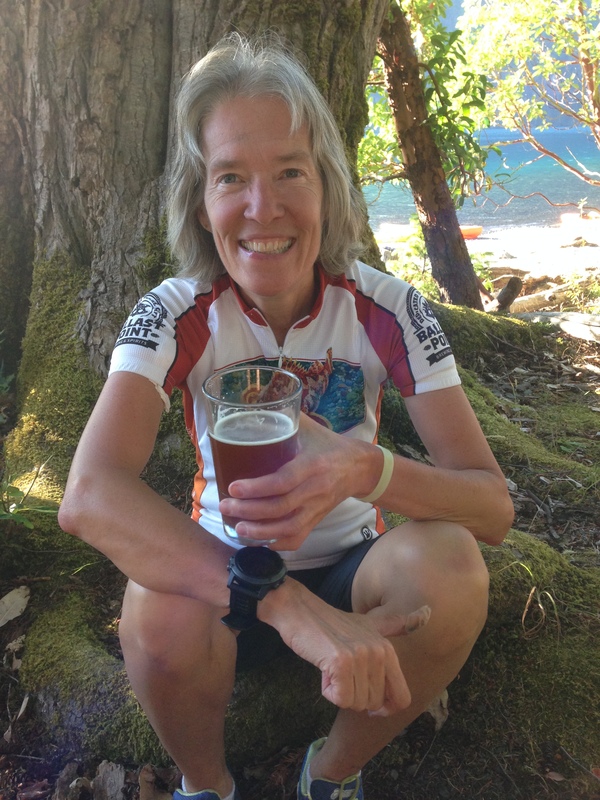 We figured we’d earned an immediate beer, so we stopped at the Lake Crescent Lodge on the way home. Since that ride, I’ve been focused on trying to ride as much as possible, as many days in a row as possible. So I cycle one day, I re-cycle the next day, you get the drift. A 50 mile bike ride, followed by another, does not seem like all that big of a deal anymore. However, the idea of stringing together several 70+ mile days still has me a little anxious. With one day left in July, I’ve ridden 659 miles so far this month. But I think I’m ready for a very big, very long bike ride.